Offer applies to bets placed on any match under Champions League and England in the odds tree in Sportsbook. Champions League refunds are valid from the group stages of the competition. Champions League Qualifiers do not count. Any bets listed under Unibet Featured or enhanced accas in the odds tree will not be eligible for refunds. Only bets with a stake of €5 or more, up to €100 will be refunded. Any bet with a lower or higher stake will not qualify for a refund. 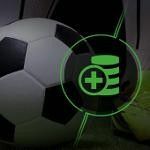 Correct Score, Halftime/Fulltime, First/last Goalscorer, Scorecast and Wincast refunds apply to losing pre-match bets only. Refunds apply to matches where a penalty is awarded (after the 90th minute of the match). Extra Time and penalties do not count. Correct Score refunds only apply to bets placed on the Correct Score (regular time) markets. Refunds do not apply to bets placed on the Correct Score (half time) markets. First Goalscorer and Last Goalscorer refers to the player who scores the first goal or last goal in the match. Own goals are not taken into consideration.